Curing MS and repairing disease damage requires innovative, groundbreaking research. Funding for research is critical. That’s why we need YOU! Support the National Multiple Sclerosis Society by joining or donating to Team MoBap. STAFF, PATIENTS, FRIENDS and FAMILY ARE INVITED on our team. 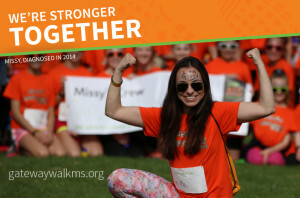 Walk MS is Sunday April 17 2016 at Forest Park Upper Muny Lot. Registration 1 PM, Start 2 PM. 9/28 WOW! Ocrelizumab effective in primary progressive MS! Ocrelizumab becomes the FIRST therapy to show positive results in a Phase III clinical trial in PRIMARY PROGRESSIVE multiple sclerosis after numerous other failed trials with other medications. In the ORATORIA study, ocrelizumab infusions in the vein reduced the risk of clinical disability progression compared to placebo in patients with primary progressive multiple sclerosis. The most common side effect was mild-to-moderate infusion-related reaction. The incidence of serious side effects (adverse events), including serious infections, was similar to placebo. ORATORIO is a Phase III, randomized, double blind trial comparing ocrelizumab infusions to placebo in 732 primary progressive multiple sclerosis. The primary endpoint of the study was the time to onset of confirmed disability progression, sustained for at least 12 weeks. Ocrelizumab was given in the vein every 6 months as two 300 mg infusions two weeks apart. Ocrelizumab targets specifically B-cells, a type of white blood cell lymphocyte. Another B-cell therapy, rituximab had failed in a previous primary progressive multiple sclerosis trial. Full abstract results coming next week at ECTRIMS in Barcelona. Join us for The MS Center for Innovation in Care’s annual program focused on the latest updates in multiple sclerosis. The meeting takes place right after the largest global MS meeting called ECTRIMS in Barcelona, Spain in October. Over 8000 people focused on curing and treating MS will attend including Dr. Barry Singer and Dr. Mark Tullman. New therapies including some expected to be FDA-approved in 2016 will be discussed. The first MS treatment to work in primary progressive multiple sclerosis trials with be reviewed. Progress on myelin repair strategies will be highlighted including research at our center. Options for improving MS symptoms and quality of life will be addressed. A question and answer session will follow. Speakers include Barry Singer MD, Mark Tullman MD and Heather Popham, NP-C. The FREE program is sponsored by Missouri Baptist Medical Center and will be held Thursday October 29, 2015 at the St. Louis Frontenac Hilton at 6:30 PM. Light refreshments will be served. REGISTER at 314-996-LIFE. Love to see you there! Ocrelizumab is an anti-CD20 antibody therapy given as an infusion every 6 months. Ocrelizumab temporarily knocks out B cells, an important immune cell involved in causing damage in multiple sclerosis. Two Phase 3 clinical trials (OPERA I and II) were conducted to evaluate ocrelizumab in relapsing multiple sclerosis. In both trials, patients were randomized to Rebif or ocrelizumab 600 mg intravenously every 24 weeks. Only the first dose of ocrelizumab was divided into 300 mg on Day 1 and Day 15. OPERA I and II randomized 821 and 835 patients, respectively. Treatment with ocrelizumab significantly reduced the number of relapses per year (annualized relapse rate), the risk of disability progression and reduced the number of brain lesions compared to Rebif treatment. Results were just announced in a press release. Exact difference will be presented at a future scientific meeting. The most common side effects of ocrelizumab were mild-to-moderate infusion-related reactions. The incidence of serious infections on ocrelizumab was similar to Rebif. The MS Center for Innovations in Care was a site for the OPERA clinical program. FDA approved Lemtrada (alemtuzumab) today for relapsing forms of multiple sclerosis. Because of its safety profile, Lemtrada should generally be reserved for patients who have had inadequate response to two or more other MS medications. Lemtrada is an antibody treatment that is given in the vein over 5 days the first year and 3 days the second year. Eighty percent of patients do not require treatment in the 3rd year. Lemtrada removes certain immune cells from the body for months (approximately 6 months for B lymphocytes and 1 year for T lymphocytes). In the CARE-MS I Trial, 581 early, active relapsing-remitting patients, who had received no prior MS therapy, were randomized to Rebif or Lemtrada treatment. Compared to those MS patients on Rebif, those individuals on Lemtrada had 55% less relapses. A low percentage of patients had worsening disability on both treatments without a significant difference between Rebif and Lemtrada (11% and 8% respectively worsened). In the CARE-MS II Trial, Lemtrada IV treatment dropped new relapses by half (49%) compared to Rebif in a 2 year trial. People with MS treated with Lemtrada also were 42% less likely to progress in disability than on Rebif and have less MRI activity. Autoimmune disease is a risk of Lemtrada including 34% thyroid disease (including 1% orbital involvement), 2% incidence of low platelets which can lead to serious bleeding complications (thrombocyopenia), and 0.3% serious renal disease (glomerular nephropathies). Other risks include serious infections (including fungal and herpetic) and serious infusion reactions including anaphylaxis. Lemtrada may cause an increase risk of malignancy include thyroid cancer, melanoma and lymphoproliferative disorders. Safety monitoring includes baseline and monthly complete blood count with differential, serum creatinine and urinalysis with cell counts monthly for 4 years. At baseline and every 3 months, blood thyroid function testing (such as TSH) should be checked. In addition, patients need baseline and yearly skin exams to screen for melanoma.